In the past couple weeks we’ve seen The Last Jedi divide Star Wars fans down bitterly conflicting lines. Slate called it “a film of genuine beauty” while The New Yorker accuses the movie of being “tamped down, boxed in, [and] neatly packaged, to a chilling extreme.” Twitter is awash with arguments, refutations, and aggressive subjectivity. Our own Goomba Stomp writers have mixed feelings about the movie; equal parts disappointed, entertained, and frustrated. To understand the diverse reactions to The Last Jedi, it’s important to understand what role Star Wars has played as both a product of and for pop-culture. What began as a passion project that no one believed in has since spawned a multi-billion dollar franchise. Although new movies have released and continue to draw widespread attention, they inevitably draw comparisons to the original trilogy. The story behind Star Wars is the story of George Lucas. As a young, rebellious film student, Lucas put his vision above all else. His first two films, THX-1138 and American Graffiti, are unique products of his creative insight and personal background. Lucas, however, had quickly come to discover that creativity often came with a price: both of his films had been subjected to studio interference. He would not let the same happen for his next project. In a bid to free himself of studio meddling, Lucas had unknowingly created a whole host of other problems for himself. Time and budgeting pressure, conflicting personalities, and technical issues plagued his fantasy space opera, Star Wars. It was a film that few people believed in. Harrison Ford would later describe his initial feelings towards the movie as “very, very weird.” He was not alone. Several cast and crew members struggled to take the movie seriously, viewing it as nothing more than a children’s fantasy picture. But it was Lucas’ undying passion for his vision that kept the project going through trials and hardships. On May 25th, 1977, Star Wars released to widespread critical and popular acclaim. A story of swashbuckling adventure, larger-than-life personalities, and far-off fantastic worlds captured the hearts and minds of people everywhere. Star Wars may have been a movie made with kids in mind, but it wasn’t a child’s movie. Star Wars is the product of classical storytelling and modern innovation. Lucas relied upon Joseph Campbell’s theories in lore and classic mythology to construct his story and characters. Campbell’s seminal work on common mythological themes, The Hero with a Thousand Faces, helped create Star Wars‘ easily recognizable and sympathetic characters. The dashing rogue, the wise old man, the hopeful youth, and the willful princess are all figures that have appeared in stories throughout history. With the second installment in the original Star Wars trilogy, Lucas and his teams would take the saga into deeper, darker territory. ‘The Empire Strikes Back’ placed a greater focus on internal character struggles and themes of desperation/despair. The audience followed the continuing development of a core cast of easily recognizable characters. The movie become an unprecedented box office hit. 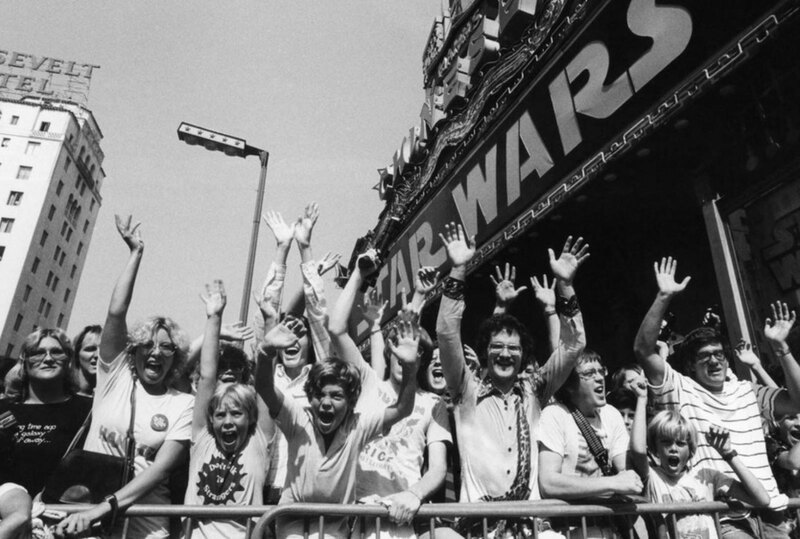 By fall of 1977, Star Wars was playing in nearly 1,100 theaters across the United States. The movie would continue to generate massive amounts of revenue and allowed Lucas the opportunity to continue his saga for two more movies. While Lucas would not return to the same hands-on role he had in the first movie, his personal vision and passion would continue to fill the rest of the original Star Wars trilogy. Lucas had never intended to stop at the first movie. In writing the original draft, he found his ideas evolved into a saga that would easily span multiple films. Following the success of A New Hope, the story of galactic warfare further expanded into uncharted territory. Audiences visited the barren ice-planet Hoth, the teeming swamps of Dagobah, and the glimmering vistas of Cloud City. Although Lucas had stepped back into more of a producer/writer role, his creative influence on the original trilogy was undeniable. In 1983, Return of the Jedi concluded the saga of Luke Skywalker, but the Star Wars epic was far from done. After nearly twenty years, Star Wars returned to the big screen in 1999. The prequel movies — Episode I, II, and III — covered the events leading into the original trilogy. This time, the story would focus on the origins of Darth Vader, the fall of the Jedi, and the galaxy’s descent into tyranny. Despite rave anticipation, the prequels generated mixed feelings that skewed more towards the negative side. The infamous Mr. Plinkett review of The Phantom Menace gained a reputation for its scathing and well-researched critique of the prequels, giving voice to sentiments that Star Wars fans harbored towards the franchise’s return. Chief among the criticisms towards the prequels were stilted dialogue, convoluted plotlines, and over-reliance on spectacle and CGI. Working on the original trilogy, Lucas ran into various checks and balances that refined his vision. Budgetary restrictions, technical problems, and conflicting opinions allowed the project to be more collaboratively structured while still operating with the scope of Lucas’ vision. When those limits disappeared, the movies suffered as a result. The prequels are ambitious, almost to a fault. These movies got the fantasy part of Star Wars right; the diversity in worlds and inhabitants gave depth and life to the galaxy. Where it failed was giving its cast of characters that same nuance and attention. Misplaced priorities and a lack of focus produced a trilogy that was all laser flash and no substance. In the ten years between Revenge of the Sith and The Force Awakens, the franchise transferred hands from Lucas to Disney. After the public outcry against the prequels, a new set of movies had to remind the audience what made Star Wars so memorable in the first place. The first of the new sequel trilogy, The Force Awakens, brought back a sense of adventure and fun that felt uniquely like Star Wars. Having similar story beats to the originals certainly helped: a wistful youth destined for greater things beyond their desert world, a totalitarian monolithic entity looming over the galaxy, and thrilling action sequences filled with daring escapes and explosive dogfights. The Force Awakens effectively eased audiences into a new movie by propping up its new characters against old favorites. While its narrative may not have brought anything new to the table, the first installment in the sequel trilogy reminded people that Star Wars could be fun. ‘The Force Awakens’ brought back a sense of familiarity to the franchise in order to ease wider audiences back into Star Wars. The sequels, unfortunately, have placed a bit too much reliance on established Star Wars elements. A host of callbacks to the original trilogy peppers both The Force Awakens and The Last Jedi. We get things like the Millennium Falcon’s holo-chess table, shots that echo scenes like the Mos Eisley reveal and the cave on Dagobah, and the fact that after 40 years, Han Solo still looks and acts like a scruffy nerf-herding smuggler. Granted, many of these aspects are still enjoyable, but as George Lucas puts it, Disney wanted to “make a movie for the fans”. The sequel movies suffer from what can be called “Disneyfication.” As Goomba Stomp editor Patrick Murphy puts it, their focus is more on “[an] irreverent, quippy sense of humor, [embracing] meta, and … the colorful fireworks display of action than to character development (the former is much easier to quickly assemble than the latter, which often requires an undefined gestation period and a deeper level of thinking).” This problem extends to both The Force Awakens and the newest addition, The Last Jedi. The lack of a singular visions prevents these wonderful bits of story and character from tying to each other into a larger narrative. They make the mistake of adhering to the preconceived notions of what a Star Wars story is, rather than what it could be. Critics of The Force Awakens readily point out that the movie’s plot is simply a rehashing of A New Hope‘s. More concerning, however, is just how disjointed the transition was from The Force Awakens to The Last Jedi. Even though Rian Johnson is credited as having written and directed TLJ, he’s still had to work with a team of roughly a dozen writers to flesh out the movie. The original trilogy and the prequels set their narratives against a backdrop of a living, breathing galaxy. The sequels so far have only used the galaxy as a setting, rather than a “character” in its own right. The sequels certainly touch upon those themes, though perhaps not as deeply as Lucas or some fans may like. Much of this comes back to the sequels’ lack of focus on a larger narrative. Many aspects get glossed over or barely touched: the Knights of Ren, the establishment of the New Republic (which promptly gets destroyed with little narrative setup), and, most glaringly, characters like Captain Phasma. Because each movie is the result of multiple writers working together, there’s little guarantee that every narrative thread ties well into each other in a movie, let alone between them. The original Star Wars movies gained immense popularity by appealing to its audience on a fundamental level. Its origins reach deeply into the collective human consciousness; tales of heroes, villains, and far-flung adventures have passed through history in countless forms. Lucas tugged on these unseen threads that have bound humanity across cultures and time. The prequels expanded that universe but neglected the characters. Audiences glimpsed a wide, weird galaxy populated by forgettable characters, convoluted plots, and hamfisted dialogue. Nearly a decade later, the sequels revisited the Star Wars galaxy with a cast of memorable characters, new and old. Among the cast and crew of the sequel movies, many of them are self-proclaimed ‘Star Wars’ fans. What was once an experimental independent movie has since transformed into a global pop-culture phenomenon. The expectations for what a ‘Star Wars’ movie is and should be continue to generate noticeable controversy. As entertaining as these new movies might be, they are made in a wholly different environment than either the originals or the prequels. Disney has broken down film production to an exact science. Individual artists may bring their own personal spin and story to the movie, but they are ultimately working within the confines of the studio. Star Wars is a passion project that became a franchise. Its scope has increased in the forty years since the first movie’s release; shifting and changing to fit different times and audiences. Whatever has been arguably lost or gained, there is no denying that audiences everywhere have continued to be captivated by a galaxy far, far away. Good article, naturally I never shy away from reading a Star Wars article because I’m fascinated by the hype that I never understood. Disney films always have a standard formula that they very rarely digress from. I don’t like Star Wars as it was, but even I could tell Disney wouldn’t be the best fit for it. The biggest problem now is they’re making it up as they go along – similar to Star Trek – so a lot of things that were previously canon will be forgotten and become obsolete, something the fanatics won’t accept. It’s why as fantasy films go, LOTR were some of the best, the literature was there before they made the films. Disney casts a big net to grab as many people as possible, and sadly for Star Wars fans, that means simplifying the original formula. That recipe didn’t quite work for The Hobbit, but I don’t think Jackson’s passion was there. It was a blatant cash grab that Jackson did his best with, but you could tell his heart really wasn’t in it. It’s the same vibe I get from the new Star Wars movies. If I remember correctly, Jackson had to take over for another director on the Hobbit and, when he arrived, the project was in terrible disarray. I don’t get the same feeling from the new Star Wars films. They don’t feel as cash-grabbing in their scope as the Hobbit was. Only occasionally, such as with Porgs, do we see that Disney considers Star Wars a business venture. Yeah, he took over for Guillermo del Toro, but really it’s something that shouldn’t have been made. I actually feel the same way about the new Star Wars movies. Though I had a better time with TLJ, I see signs of corporate interference everywhere, and storytelling passion nowhere. They’re theme park rides now, which are fine. The fun may be fleeting, but it’s still fun. Besides the first one, which was a passion project, were they ever anything else? Lol. Absolutely! They were Lucas’ babies, not a commodity. Disney paid for a name and assets so that they could make money; Lucas created that name and assets because he wanted to tell a mythic story, one that includes Empire and Return of the Jedi. The Hobbit’s problem was spreading a tiny book over three movies, should have been one movie. Disney has never been creative, always relying on the work of others to make money. Star Wars fans were doomed the moment Disney bought the franchise. I think The Last Jedi was very creative, to be honest. However, with Episode IX, I’m expecting more of what we saw in The Force Awakens. Thanks James! Glad you enjoyed. Star Wars’ franchise history is a weirdly deep rabbit hole to dive into. I absolutely understand both sides as far as feelings towards the sequels go. I’m personally glad that we’re getting a Star Wars on the big-screen that’s fun, but there’s always going to be the nagging feeling that it could have been so much more. Especially since some of Expanded Universe stuff (while equal parts great and not-so-great) was quite interesting. Well-researched and interesting write-up, Kyle. I liked both “The Last Jedi” and “The Force Awakens,” but feel that the disconnect between JJ Abrams view of the series and Rian Johnson’s is bound to create retcons aplenty. Thanks! Glad you enjoyed it. This was something I really wanted to write, since the sequel trilogy has been equal parts entertaining and frustrating. I don’t claim to be a fanboy, but Star Wars has always been pretty important to me. Same here. I’ve always enjoyed it a lot.